On April 30, 1789, as preparations were being made for George Washington’s inauguration, panic set in when organizers realized that no one had brought a Bible. Jacob Morton rushed to fetch one. Morton was a general who for two decades commanded the 1st Division of the New York Militia. For his dedication Morton Street in quiet Greenwich Village was named for him. In 1828 Greenwich Village was growing. New York City residents fleeing the cholera epidemic established homes and neighborhoods in the bucolic hamlet to the north. On winding Morton Street Cornelius Oakley built a dignified Flemish bond red brick residence in the waning years of the Federal style. Although The New York Sun reported decades later that No. 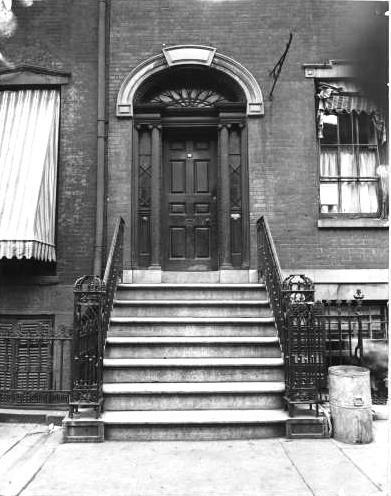 59 Morton Street was built by wealthy merchant A. T. Stewart, the assertion is doubtful. Stewart had been in the dry good business for only five years at the time and was most likely not yet wealthy enough to afford so grand a home. Three and a half stories tall with a deep English basement, the stately home was spared no expense. A deeply carved white marble entablature capped the arched entranceway. Marble lentils, rather than the expected limestone, trimmed the six-over-six paned windows. A marble stoop supported graceful wrought iron banisters that terminated in lacy openwork newels standing on paneled marble bases. The entranceway was a masterpiece of Federal design. Two fluted wooden Ionic pillars and two half pillars support a rich cornice over which a magnificent recessed fanlight is framed by an egg-and-dart surround. Between the pillars delicate leaded sidelights allowed sunlight to stream into the entrance hall. The wooden frame on either side of the eight-paneled door imitated stone blocks. Above a plain cornice board, two tall dormers provided light to the rooms of the servant girls. 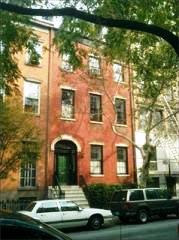 By the time of the Civil War, Morton Street was nearly completely lined with the homes of the prosperous merchant class. As the century ended, however, the fine residences found other uses as established families moved to more fashionable areas. In 1948 there were two apartments in the basement, one each on the first and second floors, two on the third and one in the dormered attic where Irish servant girls once lived. Today, remarkably, the exterior of No. 59 Morton Street is unaltered. 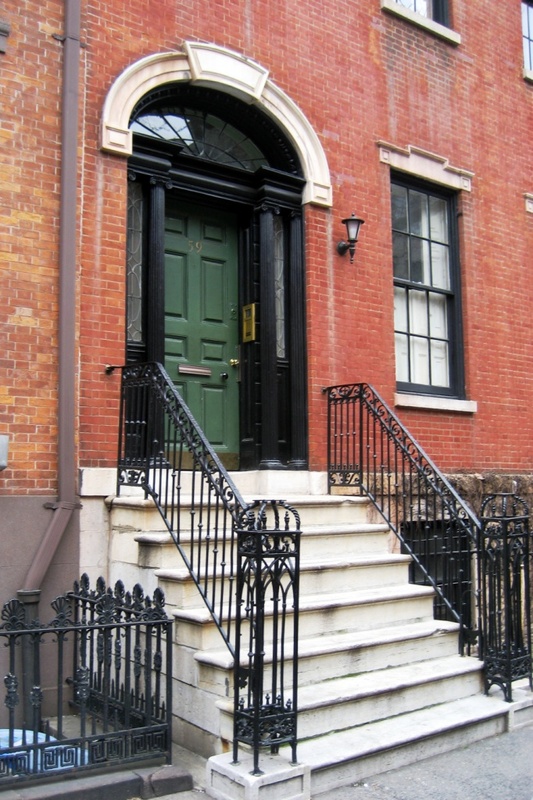 The original eight-paneled door remains, the ironwork is intact, and the exquisite entranceway, referred to by the AIA Guide to New York City as “one of the finest Federal doorways in the Village,” is untouched. Inside much of the remarkable Federal detailing survives. The house that the Depression era’s Federal Art Project of the Works Progress Administration deemed the most outstanding example of the late Federal style in New York City was sold in 2009 for $3.7 million and relisted in 2011 at $6.5 million.